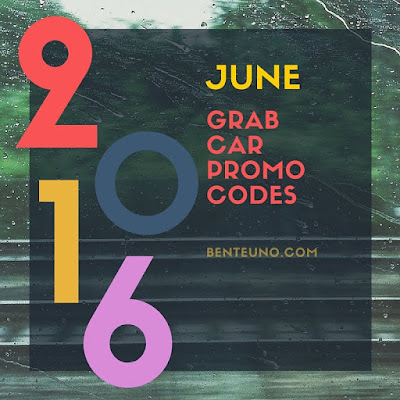 Rain or Shine here are the 2016 GrabCar Promocodes for JUNE that you can enjoy! [Update June 28] Get PHP100 off by using GrabCar Promo Code "FORWARDPH" on your GrabCar ride for 3 bookings, for Manila and Bacolod. Valid till July 1 only! Use the GrabCar Promo Code "CBD50"and get PHP50.00 off your GrabCar ride for 2 bookings to and from BGC or Makati. Valid till July 1 only! Use GrabCar Promo Code "GoCashless" on your first GrabPay ride with GrabCar and get P100 off. Good til June 30 only! June 24, use the GrabCar Promo Code "MTVMUSICEVO" when you book a GrabCar to or from MTV Music Evolution Manila 2016 at the SM Mall of Asia Concert Grounds and get a PHP 50 off for two rides. Be there early and one of first 1000 GrabCar riders to book a GrabCar going to the event venue on this date, get PHP 200 off your fare when you use the GrabCar Promo Code "MTVEARLYBIRD" valid for one ride only. For James Reid / OTWOL/ JaDine fans, here's one specially made for you. Use the GrabCar Promo Code "JAMES". No discount by using this James Reid GrabCar Promocode, but GrabPH has something special for you. Use GrabCar Promo Code GoGrabCar to get Php50.00 off your GrabCar Ride. Valid till June 8 for both GrabCar Manila and GrabCar Bacolod users. If you'll be heading to and from NAIA terminal, use GrabCar Promo Code GrabandFly to get Php 100.00 off your two GrabCar Rides. Valid til July 31. For Grabtaxi patrons, use the Grabtaxi Promo Code: "GrabCoffee" get a chance to ride a GrabTaxi giving out free coffee vouchers, valid til June 10 only. This will be available not only in Manila but also Cebu, Davao, Iloilo, Bacolod, Cagayan de Oro and Baguio.